Jochen Brill at dahm international calls to say that, having sold her to her current owner in 2009, he's signed the 31.1m sailing yacht Anamcara for sale. Built by Jongert in 2000 and having been professionally maintained by her experienced crew, Anamcara is the ideal yacht for enjoying life on board to the full. Below deck, handcrafted cherrywood and a generous layout include a large full beam owner’s suite and two guest en suite cabins. An extra cabin with a card table can also be used as an office. 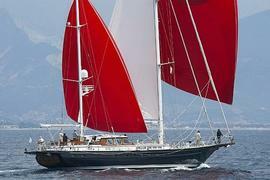 Interestingly, the word Anamcara means ‘soul friend’ in Gaelic and she's now on the market asking €3.75 million.